Boston Harbor, 1775. James Sparhawk, master and commander in the British Navy, knows trouble when he sees it. The ship he’s boarded is carrying ammunition and gold into a country on the knife’s edge of war. Sparhawk’s duty is clear: confiscate the cargo, impound the vessel, and seize the crew. But when one of the ship’s boys turns out to be a lovely girl with a loaded pistol and dead-shot aim, Sparhawk finds himself held hostage aboard a Rebel privateer. Sarah Ward never set out to break the law. Before Boston became a powder keg, she was poised to escape the stigma of being a notorious pirate’s daughter by marrying Micah Wild, one of Salem’s most successful merchants. Then a Patriot mob destroyed her fortune and Wild played her false by marrying her best friend and smuggling a chest of Rebel gold aboard her family’s ship. 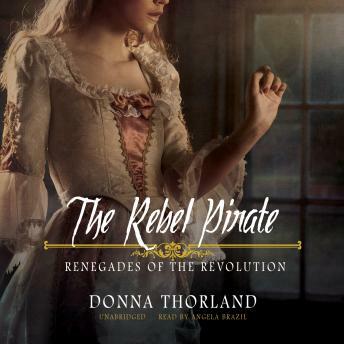 Now branded a pirate herself, Sarah will do what she must to secure her family’s safety and her own future, even if that means taking part in the cat-and-mouse game unfolding in Boston Harbor—the desperate naval fight between British and Rebel forces for the matériel of war—and pitting herself against James Sparhawk, the one man she cannot resist.